Burnout is a physical and mental phenomenon. It can include depression, exhaustion, hopelessness, anxiety, apathy, and ultimately contribute to the rising rate of dropping out of college. • Make a schedule and stick to it. Make plenty of time for work, school and study, but also to relax and engage in activities you enjoy. • Create a balanced class schedule. Don’t load up on just hard and demanding classes, and don’t just take easy classes that don’t challenge you. Take some difficult classes and required courses, but also include classes that aren’t as demanding, or pique your interest. Variance in your courseload will keep you challenged, interested, and engaged. Too much of the same thing contributes to burnout, so keep it interesting. • Finish early! If you can complete your degree early, you reduce your risk of burnout because A) the end is in sight, and B) you won’t be at it as long. 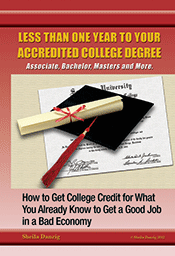 If you’ve already taken college classes before starting this degree path, or if you have work experience, you may be able to get credit that counts towards your degree completion, especially if your job is in the field of your major. To learn if finishing early is on your horizon, visit TheCareerPeople.com for an educational consultation.